This essay comes from a long-term project in which I focus intimately on how water-related issues affect people’s lives. 258 million people in African have no access to clean water. What is available often introduces a wide spectrum of disease or water based conflict into communities. Climate change has seen drought and desertification increase noticeably since the seventies. Subsequent crop failure combines with livestock death to place tremendous pressure on communities competing for water resources. Global warming has also seen island nations threatened globally as seas rise around them. Water remains a gender issue. Fetching and carrying is the responsibility of women. 40 billion working hours are lost every year in Africa to fetching and carrying water. For millions, there is no time for education or private enterprise. Water can be a terribly destructive force. Floods remain a global threat in the rainy season. Bangladesh is the most flood-affected country on earth. As a result the poor are forced from their homes for up to five months every year. There is an abundance of water but little is safe to drink. The flooding also closes factories for months at a time, eroding employment. Water privatization issues loom large for the Third World. Increasingly we see foreign control over water resources for agriculture in Africa. The food produced is for export and does not benefit locals. Instead it threatens already meager water resources. Mining contaminates huge amounts of vital clean water sources. In Papua New Guinea mining operations have poisoned the environment to such an extent that populations 150 miles away have been impacted. This is mineral exploitation by wealthy companies with no regard for local populations with ancient lifestyles that depend on clean rivers. Progress often means development that has little regard for water resources. There are ingenious community-based solutions. What is lacking are solutions at a global leadership level. 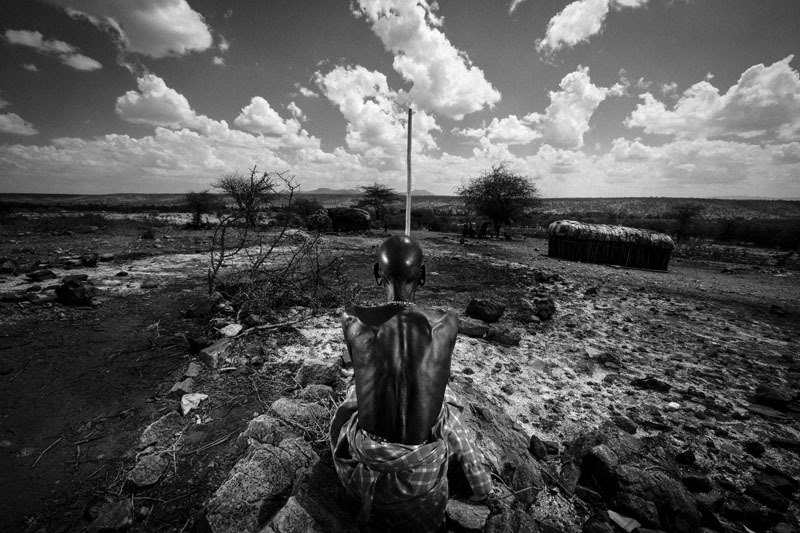 RIFT VALLEY PROVINCE, NORTH KENYA, 18 NOVEMBER 2009: An emaciated Samburu Elder pastoralist stands in his burnt-out cattle boma at at time of the worst drought in Kenya for the last 100 years. It is traditional for the Samburu and other pastoralist groups to burn their bomas if they lose all their cattle to disease or drought, it is done as a cathartic excercise to remove the bad luck of the old and hopefully bring about better luck for the future. Many Samburu have lost up to 95% of their herds, making starvation a real threat over the coming months. The drought has brought about increasingly deadly conflict between pastoralists as well as conservationists all competing for grazing land.